The mission of Coats for Kids is simple, “Anyone who needs a coat will have one.” Each fall, Anton’s collects, cleans, and distributes over 60,000 coats for children and adults. 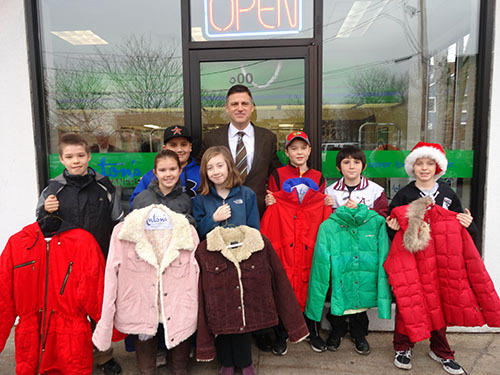 There are more than 250 schools as well as over 300 companies, clubs, organizations and thousands of individuals who donate good quality coats. Nearly 90 social service agencies make sure the coats get to those in need, free of charge. 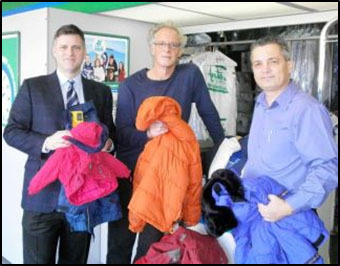 Since the program’s conception in 1995, we have collected and distributed nearly 800,000 coats. Channel 5’s Bianca de la Garza interviewed students on what being involved with Coats for Kids means to them. Arthur Anton Jr. pictured with Brackett Elementary School Students. Arthur Anton Jr., creator of Coats for Kids and C.O.O Anton’s Cleaners (Left) pictured with Celebrity chef and owner of Summer Shack Restaurants Jasper White (Middle) and Sidnei Felipe, GM of the Summer Shack Restaurant in Dedham, MA. Thank you for collections Summer Shack Restaurants, and helping to keep someone warm this winter!